In the Korea Baseball Organization this year, no lead is safe against the Kia Tigers. But on the flip side, no deficit seems too big against them either. Take last Sunday's game, for instance. The Tigers took a 7-1 lead into the bottom of the ninth against the Nexen Heroes at Gocheok Sky Dome in Seoul. Then the Heroes put up seven runs on the board against four Kia relievers to complete the largest ninth-inning comeback victory in the KBO's 35-year history. Kia starter Hector Noesi struck out six batters over eight solid innings but watched helplessly from the dugout as the six-run cushion disappeared in a hurry. The Tigers are still in first place at 75-45-1 (wins-losses-ties), 4.5 games better than the Doosan Bears. The Tigers are also the KBO's best hitting team. They're batting .304 as a team -- the only club batting over .300 -- and they've scored a league-best 777 runs. 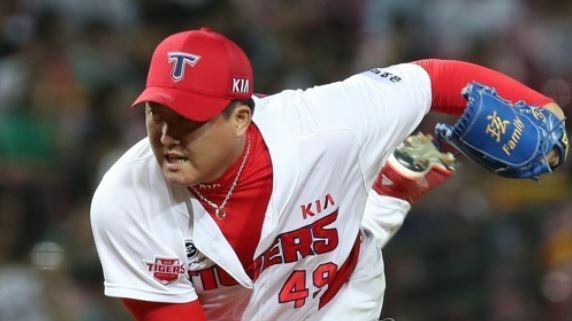 Led by Noesi and South Korean left-hander Yang Hyeon-jong, the Tigers' rotation has a 4.39 ERA to rank second in the KBO. But the bullpen has been a much different story. Their relievers have put up a 5.54 ERA, seventh among the 10 teams, and they've gone through multiple closers so far. Former Chicago Cubs reliever Lim Chang-yong began the season as the closer but was stripped of the job after a shaky early stretch. Right-hander Kim Yun-dong took over, but he too has been up and down. The one bright spot of late has been right-hander Kim Se-hyun, who has settled in after arriving in a late July trade from the Nexen Heroes. He has picked up four saves since joining the Tigers, with an ERA of 3.00 in 10 appearances. But the spectacular collapse Sunday is hardly new for the Tigers, who have the KBO's worst opponents' batting average from the seventh to ninth innings at .288. On April 7, they were leading the Samsung Lions 7-0 heading into the bottom ninth and promptly gave up seven runs. The Tigers prevailed 9-7 in 10 innings. On Aug. 26, the Tigers took an 8-3 lead into the ninth against the NC Dinos, which made things interesting by scoring four runs off the Tigers' bullpen before losing 8-7. Three days later, the Tigers were up 10-2 on the Lions, which put up four runs in the bottom seventh and three more in the next frame to make it a one-run game.